You like Blues and Classic Rock but you struggle in finding something "new" to play? Do you catch yourself using always the same licks when you improvise? Do you like the pentatonic scale but you think it's limiting? Well, I used to think the same. Sure, it's always good to know a lot of scales and arpeggios, but sometimes the good old pentatonic scale is what your guitar needs. The problem is that this scale has been played so many times that seemingly all original phrases have already been played... or are they? The truth is that you can create easily something new and exciting using the pentatonic scale on your guitar if you only use a bit of music theory and a trick called "sequencing". In the video below I explain what sequencing is and how you can apply it immediately (in real time!) to your playing. Not only it will help you compose new melodies, but you can also use it as a great technique exercise. 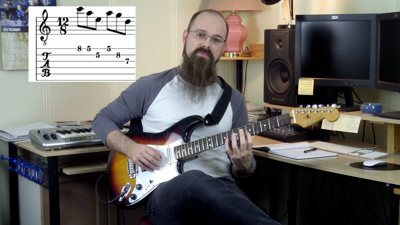 Watch this video on Creative Pentatonic Sequences so that you can learn too how to create new and original phrases with the pentatonic scale!